Looking south on Forest Park Avenue from near the corner of Randolph Street in Springfield, sometime in the early 1900s. Image courtesy of Jim Boone. For most of the 19th century, the area that would become Springfield’s Forest Park neighborhood was only sparsely settled. 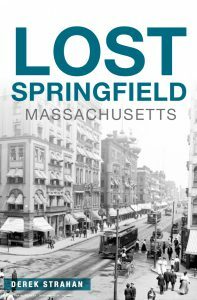 However, with the opening of a trolley line to the area in 1890, the southwestern corner of the city suddenly became within easy commuting distance of downtown Springfield. One of the first developers in the neighborhood was the Mutual Improvement Company, which purchased much of the land in the large triangle between Fort Pleasant, Belmont, and Sumner Avenues. A number of new streets were laid out, including Forest Park Avenue, which is seen here near the center of the development. The Mutual Improvement Company was founded by John and William McKnight, the brothers who had been developing Springfield’s McKnight neighborhood since the 1870s. Like in McKnight, they sought to create an upscale residential neighborhood here in Forest Park that would appeal to Springfield’s leading citizens. Nearly all of the houses were unique, and were designed by some of the city’s leading architects. They also sold undeveloped lots, although these deeds came with restrictive covenants that required a specific setback from the road and a minimum construction cost. Development in this section of Forest Park began in the early 1890s, primarily in the area between Garfield Street, Churchill Street, Sumner Avenue, and Forest Park Avenue. A few of these homes are visible in the distance, and they tend to have Queen Anne-style architecture, which was popular in the last decades of the 19th century. However, the large-scale development of this area did not begin until after 1900. 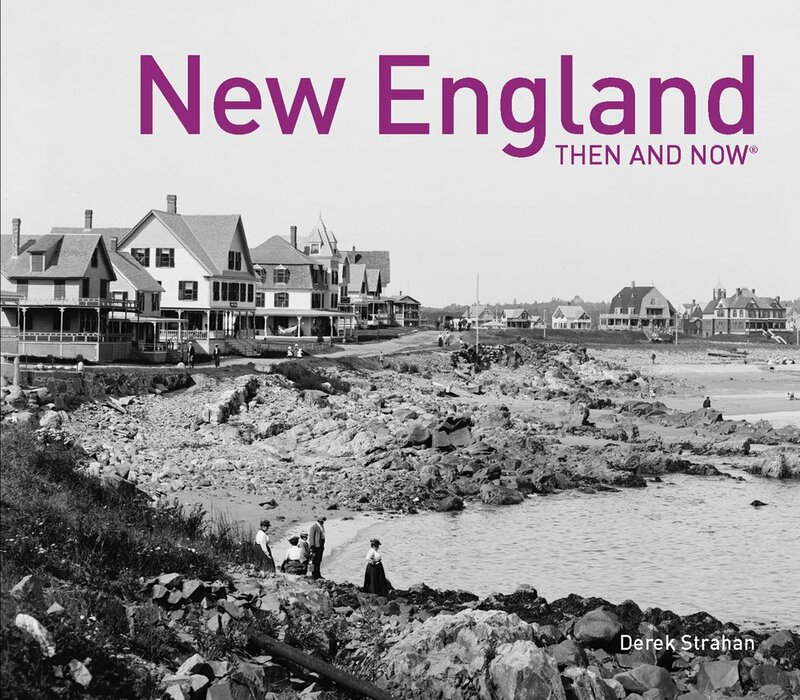 At this point, architectural tastes had shifted toward Colonial Revival, as can be seen in the house on the far left, which was built in 1902. 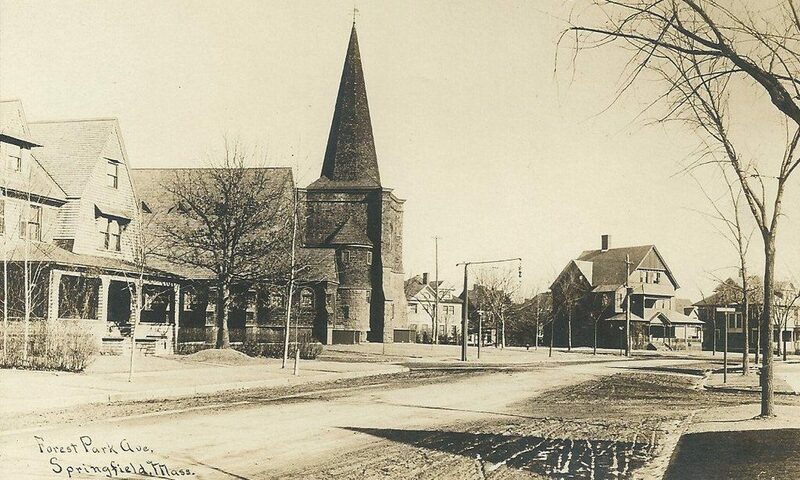 Other buildings that were completed during this second phase include the 1901 Park Memorial Baptist Church, which is visible in both photos. About a century after the first photo was taken, the Forest Park Heights neighborhood remains remarkably well-preserved, and very little has changed in this scene on Forest Park Avenue. The only significant difference is the house on the right side of the first photo, at the corner of Garfield Street. It was built in the early 1890s, and was the home of candy manufacturer Franz Jensen. 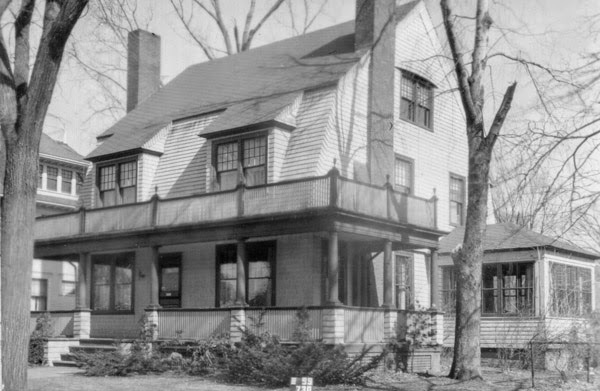 However, it was demolished in the 1930s, and was later replaced by a smaller Cape-style home in the 1940s. Overall, though, most of the historic homes in this neighborhood have survived with few major changes, and in 1982 the area was added to the National Register of Historic Places as the Forest Park Heights Historic District. The house at 175 Forest Park Avenue in Springfield, around 1938-1939. Image courtesy of the Springfield Preservation Trust. This house was built in 1902 as the home of Rufus and Clara Winsor and their daughter Harriet. Rufus was originally from Dorchester, where he was born in 1843, but he later entered the textile industry. He worked as paymaster for several different mills, including the Ludlow Mills, which were located just across the Chicopee River from Springfield’s Indian Orchard neighborhood. He and his family lived in Ludlow until 1898, when they moved to Forest Park, and four years later they moved into this house. Rufus and Clara had four children, although Harriet was the only one to survive to adulthood. Two of their children, Anna and Rufus, died a week apart in 1885 at the ages of eight and five, and their youngest child, Helen, died in 1891 at the age of four. Harriet never married, and she inherited the house after her parents died in 1918. She was still living here when the first photo was taken, and remained here for another decade or so, until her death in 1949 at the age of 74. 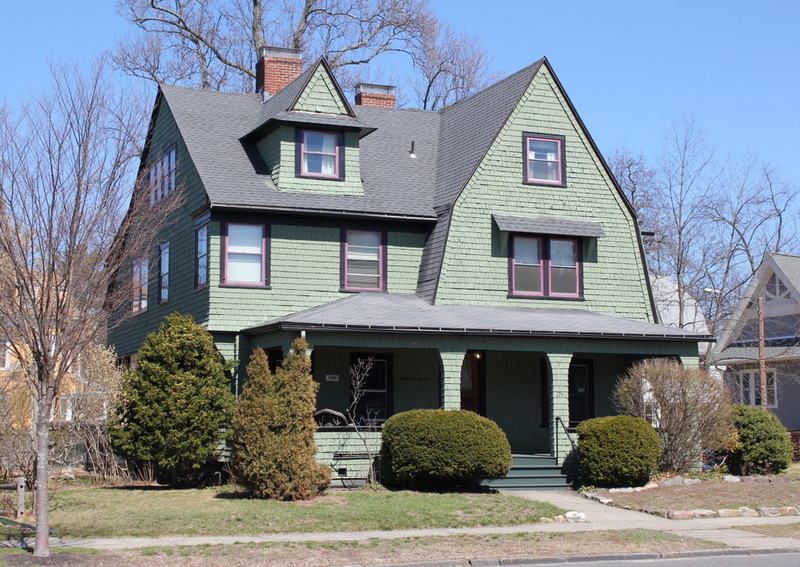 Like so many of the other houses in this neighborhood, the house has been well-preserved, and still retains its original turn-of-the-century Colonial Revival appearance. It is now part of the Forest Park Heights Historic District, which was added to the National Register of Historic Places in 1982. 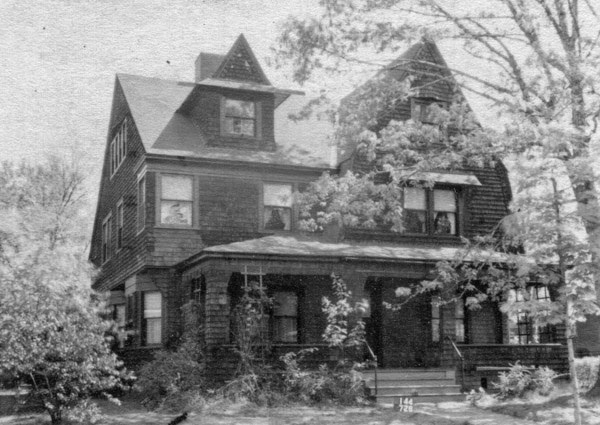 The house at 233 Forest Park Avenue in Springfield, around 1938-1939. Image courtesy of the Springfield Preservation Trust. 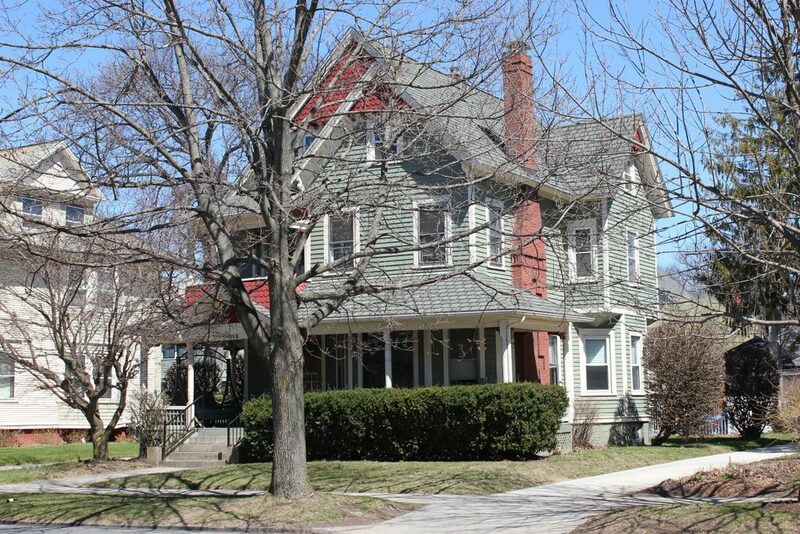 This house was built in 1895 as the home of Arthur B. Lewis, a merchant who sold hats and other “men’s furnishings,” as the census records describe it. He and his wife Lena had nine children who grew up here, although one of their children, Arthur Jr., died in infancy in 1901. This house would have been crowded by the 1910 census, when all eight of their surviving children were still living here, with ages ranging from one to 20. Along with this, they also employed two servants who lived here. Lena died of pneumonia in the fall of 1910 at the age of 45, with her death certificate indicating that, as a Christian Scientist, she did not receive any medical care for her illness. A year later, their daughter Alice died just a week before her sixth birthday. According to her death certificate, she died of starvation from being unable to retain food, with hot weather being listed as a contributing factor. Arthur remarried in 1914, and he and his second wife Ada were still living by the early 1920s, along with several of Arthur’s younger children. By 1930, the house had been sold to Frederick D. Davis, a physician who lived here with his wife Blanche, their daughters Fredericka and Clarisa, and his parents, Lemuel and Lillian. However, Lemuel died in 1936, and Frederick died two years later, right around the time that the first photo was taken. Soon after, Blanche sold the house, and she and Clarisa moved to a nearby apartment on Sumner Avenue. The house was subsequently owned by Michael Katz, the president of the Springfield-based Country Club Soda Company. A Jewish immigrant from Russia, he came to the United States in 1890 and soon after married his wife, Lena. They were both in their early 70s when they moved into this house in the late 1930s, and they lived here with their widowed daughter Rebecca and her daughter, Elaine. The family lived here until the early 1950s, when Rebecca, Michael, and Lena all died between 1951 and 1953. In 1960, the house was purchased by Charles V. Ryan, who lived here with his wife Joan until 1976. During this time, Ryan served as the mayor of Springfield from 1962 to 1967, and unsuccessfully ran for Congress against Edward Boland in 1968. However, he returned to the mayor’s office 36 years later, serving two terms from 2004 to 2008 and becoming the city’s only mayor to serve non-consecutive terms. In the meantime, very little has changed with his former house. It remains well-preserved and, along with the rest of the neighborhood, it is part of the Forest Park Heights Historic District on the National Register of Historic Places. 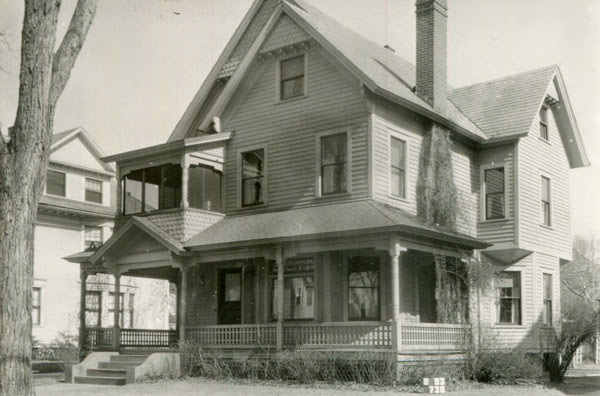 The house at 215 Forest Park Avenue in Springfield, around 1938-1939. Image courtesy of the Springfield Preservation Trust. Springfield’s Forest Park Heights neighborhood was developed around the turn of the 20th century, at a time when architectural tastes were shifting from Queen Anne to Colonial Revival styles. The majority of the homes in Forest Park are Colonial Revival, but some of the older homes, including this one, have Queen Anne architecture. It is located on Forest Park Avenue opposite Maplewood Terrace, and it is one of the oldest houses in the neighborhood, having been built in 1892. During the 1900 census, this house was owned by Frederick Ross, who lived here with his wife Anna and their daughter, Hazel. Born in Canada, Frederick immigrated to the United States in the late 1880s and married Anna a few years later. The 1900 census indicates that he was a traveling salesman, and subsequent censuses indicate that he sold, of all things, coconuts. He was still living here with Anna and Hazel in the 1920 census, and was still selling coconuts, while Hazel worked as a clerk for the city water department. However, Anna died in the 1920s, and by 1930 Frederick was living in an apartment nearby on Belmont Avenue. 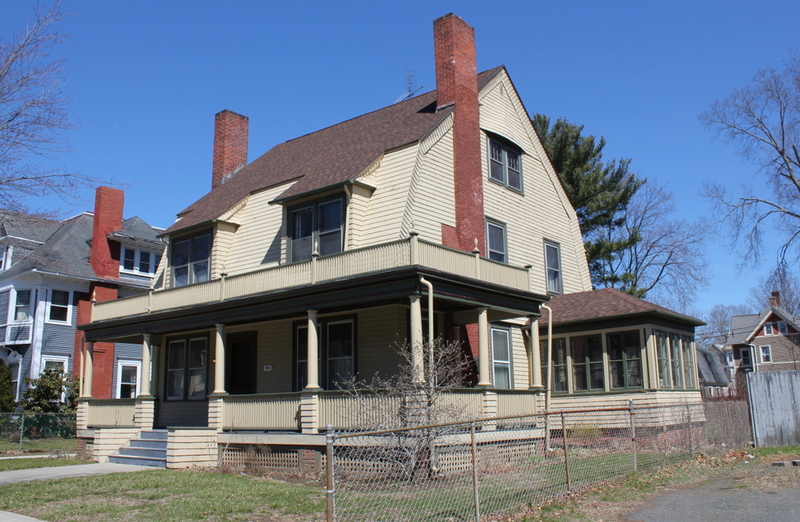 The next owner of this house was Horace E. Allen, a lawyer who was living here by 1930, along with his wife Mary, their three children, and Mary’s father, William Ballantine. A retired Congregational minister and college professor, Ballantine had served as president of Oberlin College from 1891 to 1896. He then came to Springfield and taught Bible at the International Y.M.C.A. Training School, which later became Springfield College. After his retirement in 1921, he wrote several books, including a translation of the New Testament. Ballantine lived here with his daughter and son-in-law until his death in 1937 at the age of 88. The rest of the family was still living here a year or two later when the first photo was taken, but at some point in the 1940s they moved to Longmeadow. Since then, the house has remained well-preserved, and this scene has hardly changed in the past 80 years. Along with the rest of the neighborhood, the house is now part of the Forest Heights Historic District on the National Register of Historic Places. 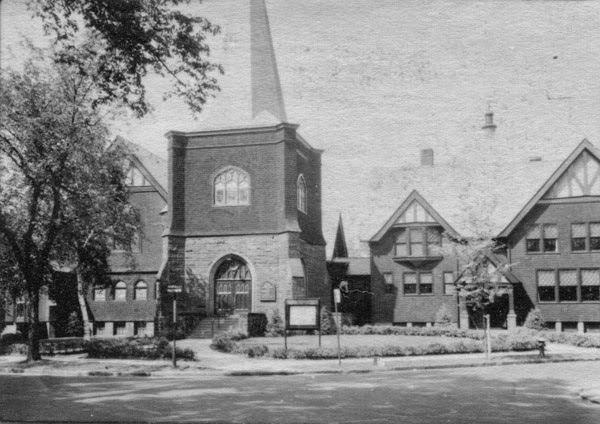 The Park Memorial Baptist Church at the corner of Forest Park Avenue and Garfield Street in Springfield, around 1938-1939. Image courtesy of the Springfield Preservation Trust. 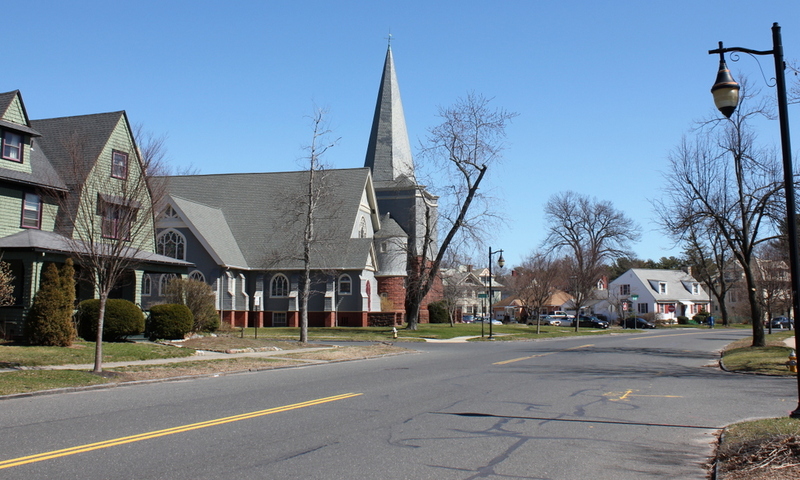 This section of the Forest Park neighborhood is almost entirely residential, but there are also several historic church buildings, including the Park Memorial Baptist Church, seen here at the corner of Forest Park Avenue and Garfield Street. 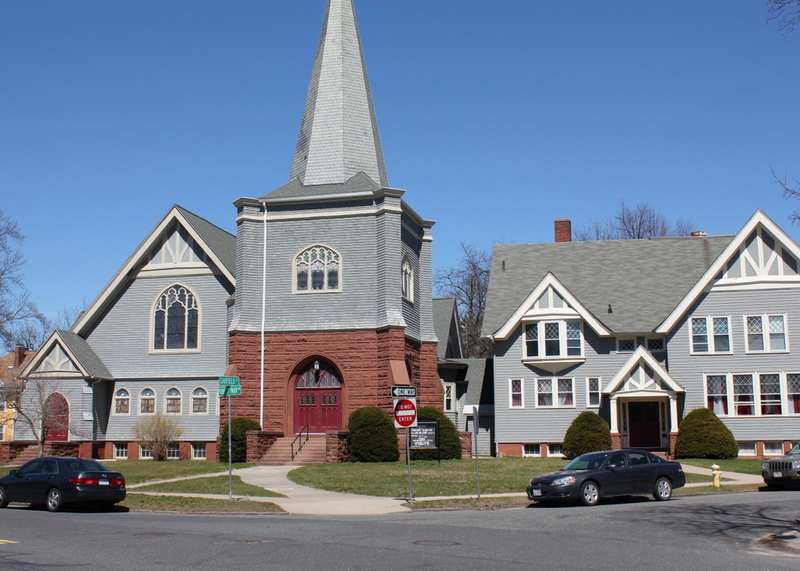 The church was established in 1892, and this building was completed in 1901, just as the surrounding neighborhood was being developed, and it served the nearby residents who lived too far from the Baptist churches in downtown Springfield. The name refers to the fact that it served as a memorial to several local Baptist leaders: Dr. George B. Ide, pastor of First Baptist Church; Dr. A. K. Potter, pastor of State Street Baptist Church; and Jonathan Gould Chase, a deacon of First Baptist Church. Since its completion, the only major change to the exterior of this building is the addition on the right, which was built around the 1920s. Essentially nothing has changed since the first photo was taken, though, and the building remains a prominent landmark in the Forest Park neighborhood. However, over the years there have been some changes to the church congregation itself. In the early 1900s, the First Baptist Church merged with Highland Baptist and State Street Baptist, and for many years was located at the corner of State and Stebbins Streets, but in 1982 they merged with the Park Memorial Baptist Church and moved into this building. Now named the First Park Memorial Baptist Church, the church continues to hold its services here, and the building itself is now is part of the Forest Park Heights Historic District on the National Register of Historic Places. 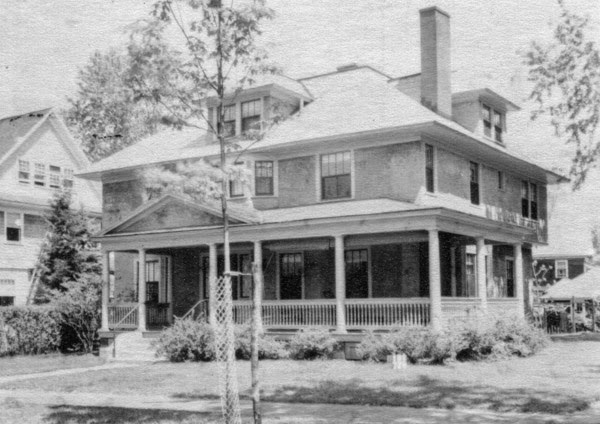 The house at 121 Forest Park Avenue in Springfield, around 1938-1939. Image courtesy of the Springfield Preservation Trust. 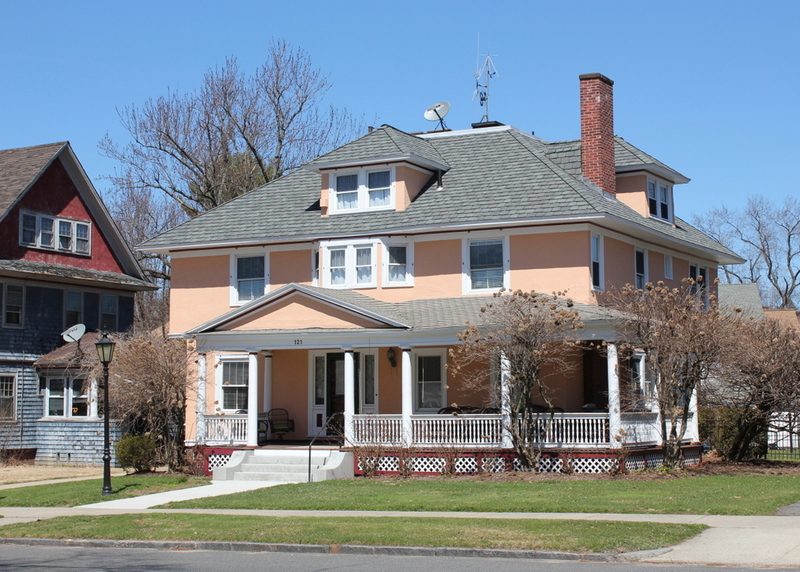 This Colonial Revival-style house was built in 1909 as the home of Dr. Ralph Carleton, an ophthalmologist who worked at Springfield Hospital. An 1894 graduate of Harvard Medical School, Dr. Carleton began practicing in Springfield in 1897, and two years later he married his wife, Julia Louise Van Schaack. They moved into this house when it was completed in 1909, and they were still living here some 30 years later, when the first photo was taken. They did not have any children, but by the 1940 census they were living here with Julia’s twin sister, Leila. Ralph Carleton died in 1940 at the age of 70, and Leila died two years later. Soon afterward, Julia sold the house, and very little has changed in its appearance since then. It is one of many well-preserved early 20th century homes in the neighborhood, and in 1982 it became part of the Forest Park Heights Historic District on the National Register of Historic Places.